The Total CIO | Andy (Avraham) Blumenthal: Minions Help Me! This was a funny picture I took in Washington, D.C. This women is sitting on the Metro. On her lap are two big bags. 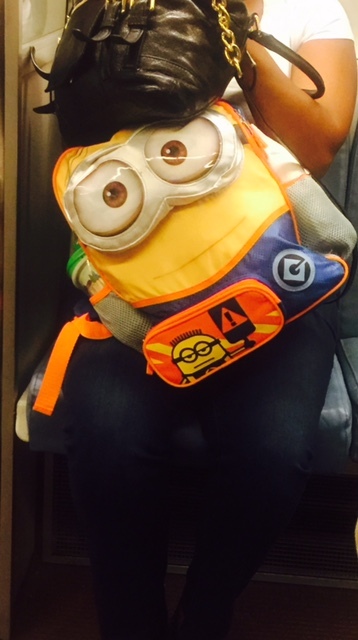 One bag (a knapsack) has a Minion on the front. And on top of the Minion bag is her overfilled buldging handbag. The Minion is slanted sideways with the heavy handbag on its head, practically squooshing his face. From the likes of it, the Minion looks like he's got one big headache and wants out of there. His eyes pleading for a new owner to loyally serve or just to get that darn heavy handbag off its head. Labels: Bags, Cartoon, Face, Funny, Headache, Metro, Minion, Photo, Squoosh, Washington D.C.